Alexandra Rippy is a weight loss and fitness expert who has been writing for the past 10 years. Rippy holds a Bachelor of Arts in Communication with a concentration in English from Manhattanville College in New York. She has written for Examiner.com, "Ink Magazine" and The New Times. Slim legs can be a female's best accessories, but sometimes obtaining them can require significant work. A treadmill, which is versatile and offers an array of workout routines, can get you a step closer to your goal. Whether you are trying to build muscle or lose weight, the treadmill will aid you in your fitness goals and improve your cardiovascular fitness at the same time. Strength training burns fat and maintains and increases lean muscle. In addition, this form of training increases your metabolic rate; therefore, you burn calories throughout the day and even post workout. Due to strength training's affect on fat and lean muscle, this would be the best form of training to acquire slim legs. By incorporating a strength-training regimen on the treadmill that targets your legs, you will notice a decrease in fat as well as a more toned lower body. The highest incline would deliver a strength-training workout to slim your legs. 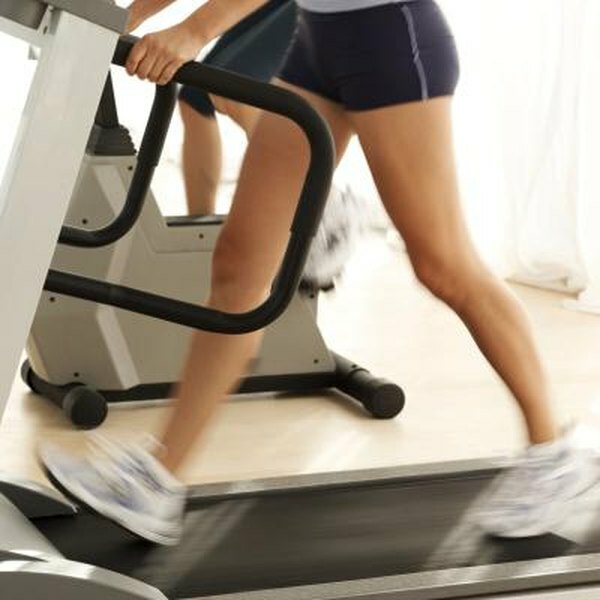 Set the incline to 15 degrees, which is commonly the highest incline on most treadmill models. In addition, set the treadmill to a slow pace of 2 to 3 miles per hour. By walking up a high incline at a slow pace, you prolong your muscular contractions, thus burning more fat. Interval training is another form of exercise that may help slim your legs. Interval training is exercising at different levels, with short intervals of more intense levels. For example, walk at an incline of 10 degrees and a speed of 3 mph for five minutes. When the five minutes has ended, sprint for one minute at an incline of five degrees. When the sprint has ended, do forward lunges at a speed of 2 mph for two minutes. Repeat the interval three times. This training builds muscle, increases endurance and spikes your metabolism for an increased metabolic rate. Consult your physician prior to partaking in a strength training regimen or interval training regimen. Use the treadmill with caution as the moving belt can lead to imbalance and injuries. Remember to stretch before and after every workout to prevent possible strains. Drink water throughout the day to stay hydrated and energized. How Long Do I Need to Work Out on a Treadmill?